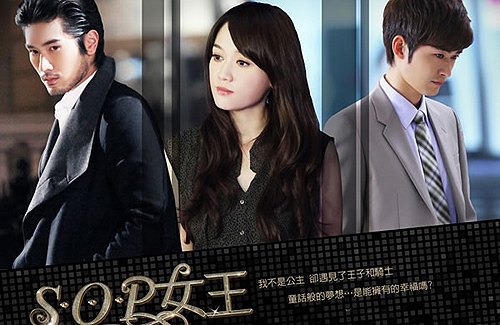 Joe Chen (陳喬恩) and Godfrey Gao’s (高以翔) Taiwanese drama, The Queen of SOP <S.O.P.女王>, has achieved good results during its broadcasts in mainland China, Malaysia, Singapore, and Japan. Now, the romantic idol drama finally has its chance to air in Hong Kong. The Queen of SOP, which premiered on TVB’s Drama 1 channel on July 10, stars Joe as Lin Xiaojie, who starts a business with her online friend, Tom (Hans Zhang 张翰), after breaking up with her ex-boyfriend and former boss, Gao Ziqi (Godfrey). After finding out that Tom is the son of an extremely wealthy business tycoon, she begins to doubt his intentions about helping her. Joe Chen’s popularity absolutely baffles me. She’s not a good actress and relies too much on these cutesy roles. I made it through Hans Zhang’s painful English but dropped it midway anyway because it was mind-boggling convoluted. Not even for you Godfrey, will I suffer through that kind of torture! i never seen her act before but i dont think she’s pretty. Joe’s popularity is no different from Rainie Yeung, IMO. Fortunately, Joe has great chemistry with all her male counterparts, hence my opinion to why she’s so popular. I liked her a lot in Prince turns into a Frog and I have yet to watch anything else of her since then. I prefer Ady An over her though .. Try “Fated to love you”. She became popular after this show. Rainie Yang is a great actress & a great singer. Acting is subjective once again…I think Joe is a better actress than Rainie is, but that is just my opinion. in my opinion i think Joe is better than Rainie too. But I also like Ady An more. I personally like Joe as an actress and her acting is actually a lot of better than many of the other actresses right now. She actually became popular after “Frog Prince” and “Fated to Love you” gave her another big boost in popularity. Have you seen her in Swordsman? That drama with her was amazing! That is definitely a breakthrough. I’m not really liking this drama much. But Swordsman was outstanding with her acting! @advo You should tried her newish drama, (I don’t think it’s that recent), called Swordsman. She totally nail that role, and she wasn’t cutesy at all. Side note: I tried to rewatch Prince turns into a frog, and it wasn’t good at all. I guess you shouldn’t watch your childhood favorite drama, it ruin it. I prefer not to poke my eyeballs out so I will be avoiding the trash that is Swordsman. Sorrynotsorry. advo, wise decision however much I love wallace huo. Yup theres a sequel. But both Godfrey and Joe Qiao En are not in it lime they’ve mentioned. Generally I don’t get the appeal of modern Taiwanese drama because the moment I hear them speak, I changed channel. But when I do watch, I get the idol appeal but that’s the problem; all of them are the same in a way. If I had to hear a girl narrating her feelings over a cold hearted but hero guy, urghhhhh! So true but yet once I start on one, i start to watch the whole thing … and then the tears start rolling down. I guess you just don’t like Taiwanese series at all Funn. But I think you should give them a chance, or is it because you watch series in Cantonese only?? I actually enjoy many Taiwanese series and not all of them are idol type series. There are some that are really emotional and touches your heart. Some are based on real life stories and themes such as Angel Love and Gloomy Salad Days. I enjoyed both of those series and they both bought tears to my eyes because they were so touching…. The one play Godfrey’s girlfriend: Jiang Yi/Coco Jiang. She is beautiful and has a great figure. I continued watching and finished this series because of her. She just had her first daughter in case you did not hear about it yet. I saw her in Angel Love and enjoyed her acting as well. Glad to see that she is still acting. not yet thanks for the info!!!! I meant I like Coco Jiang. Sorry to say. I used to like those Taiwanese idol dramas. But it gets so repetitive. A part of me wants to likes to watch the (fairytale like) story. But another part of me is thinking how on earth can something like that happen. I mean what are the chances to have 2 great guys (scoring extremely high in personality, appearance, career/money wise) interested in me at the same time and then to worry which to choose?? It would be as close as to 0 or as easy as winning the lottery’s jackpot.